i just finished up making three bridesmaid dresses for my sister’s wedding (one month from today!!! eeks!!!) and since one of the bridesmaids is very close to my size, i thought i would snag some pics. while bridesmaid dresses are notoriously awful, i think these turned out pretty cute. that’s not to say any of them will see a second wearing, but it certainly beats some of the awful dresses i’ve seen over the years. so, how does one approach making three of the same dress? basically i worked factory style and just did each bit three times. i didn’t want to get to the end of the first dress and then have to start completely over TWO MORE TIMES. i managed to finish all three in about a week excluding cutting time. i never count cutting time. i used new look 6776 with a few modifications. i cut the bodice straight across, raised the neckline a touch, added the straps separate, lowered the back bodice, and cut the back bodice as two pieces to continue the midriff all the way around. i wanted continuity from the wedding dress to bridesmaid dresses and i think these changes make the designs work together. i also changed the gathers under the bust to pleats since there are pleats on the skirt and my ocd just needs things like this to be the same. since i was making dresses for other people who live no where near me (and hence could not do fittings as i went) i constructed these dresses different than i normally would. i sewed the entire back of the dress separate from the front, then joined them at the side seams. i did the same with the lining. this way, if minor alterations need to be made (i already did a muslin fitting earlier) i can just pinch or let out without having to rip too much apart. typically i sew in a more top down approach: sew the bodice, join to the midriff, then join to the skirt, sandwiching the seam allowances between the shell and lining. adjusting the fit with that type of construction is a royal pain. 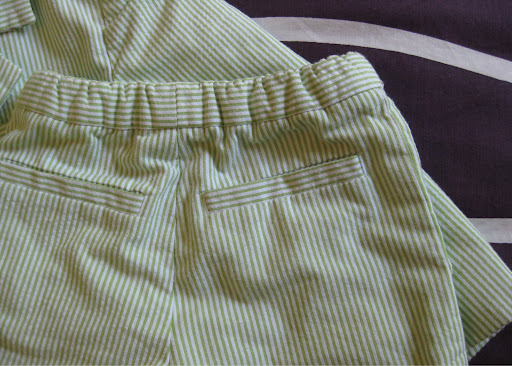 since i sewed the front and back separate, i was also able to insert the zips in the flat. i cannot tell you how much faster and easier it was to do it this way. without all that extra dress to fuss with and move out of the way the zips took maybe five minutes each. not kidding. 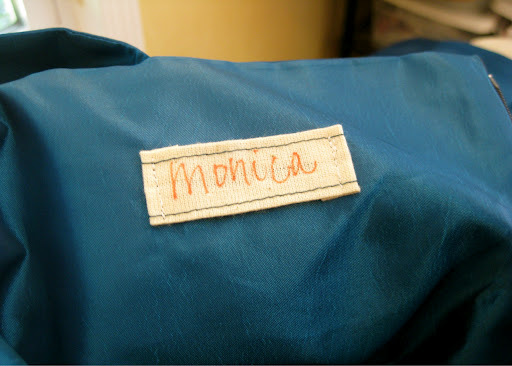 then i used tasia’s method i saw over on the sewaholic blog to sew the lining to the shell. also, super fast with a nice tidy finish. i left the straps to sew in via the “reach up between the layers and pinch” method and sewed them in the front only. i’ll wait until i can fit them in person to sew them in the back, so for now they’re just pinned. tagged the inside of each with her name so nobody gets confused! now the only beef i have with this method is that there really isn’t a chance to understitch the neckline. there’s just no way around this, so i took some steps to make sure the lining doesn’t roll and the neckline remains stable with wear. first i applied a 3/4″ strip of fusible to the shell all along the top (before sewing it all together, of course). then i trimmed the top of the lining fabric by 1/8″ so the shell would roll slightly inward, and finally i pick stitched along the front of the bodice neckline. 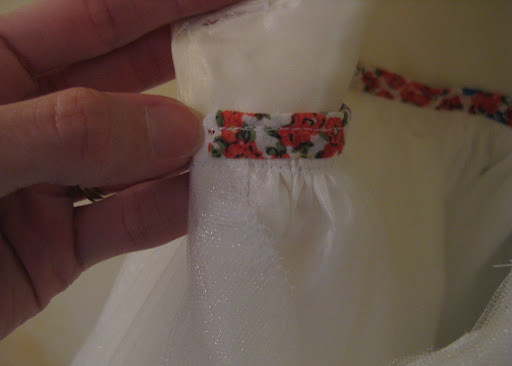 inside of bodice: i don’t know why, but i am so in love with the pick stitch. next time i’ll do it in a contrasting thread color so it shows up more! i can’t pick stitch the back of the bodice since i need to be able to finish sewing the straps in later. now, you woulda thunk i’d have taken some inner construction pictures. but then you’d a thunk wrong. i just wanted to push along and get these done. plus, a large chunk of my sewing was done after hours and my lighting is abysmal. 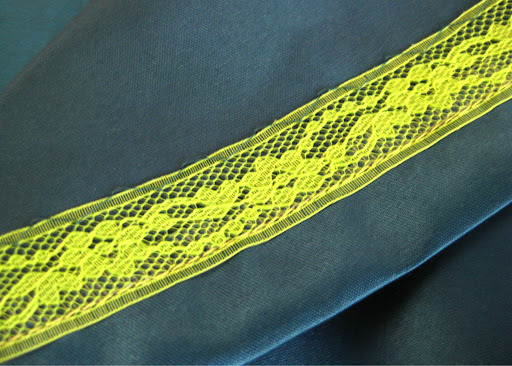 i finished the hem with lace hem tape and a blind catch stitch. i’m pretty impressed with my blind hemming capabilities here, my stitching on this “everything shows up” fabric is about as invisible as it gets. this is a post completely unrelated to wedding garb. hoo-ray! while i still have some work to do, namely making three bridesmaid dresses… i have so many non-wedding projects i have completed over the past couple months i’m not sure where to start. so how about some shorts? and a few washings later, they’re nicely broken in. eventually i want to venture into the world of making pants, and figured shorts were a good place to start. as a bonus, they sew up quick and don’t require much material. i searched for a shorts pattern and was more than disappointed. all i want is a regular fly, pockets and belt loops and no elastic. is that too much to ask? eventually i found mccalls 5391 which hits almost every note. it has a zip fly, but it’s not faced and there are no back welt pockets. not a big deal to add this in myself, just… annoying. i’m sure the market for making shorts is not a huge one, but these few details are not hard so i have no idea why they are constantly omitted from patterns! i’m done ranting. for now. this mccalls pattern is about the closest to RTW i could find and with a few modifications they’re pretty darn passable! 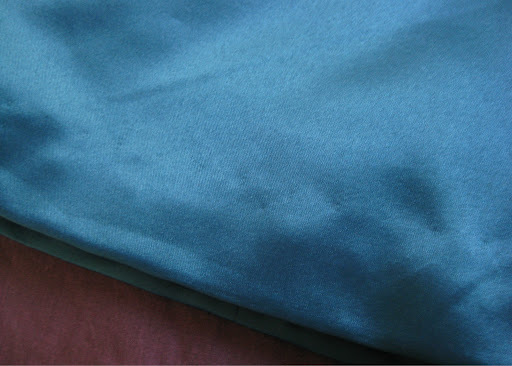 i chose a blue twill (it’s organic! look at me being all environmental!) with no stretch. i made up a muslin i had hoped would be wearable, but the material sorely needed underlining to stabilize it. it isn’t see-through, just not tightly woven. oh well, i got the sizing changes i needed. these were surprisingly easy to fit, and i only had to make a few changes. i did a “large bottom adjustment” (i swear that’s what my book says!) to fix the terribly gaping back waistband thing. i should have also have added length at the crotch point as the lady bits are a little more snug than i prefer, and there is a bit of wrinkling in the front. though the wrinkling is far more obvious in pictures than is noticeable in person. then again, in person i’m not staring at my own frontside. moving on. i also added length to the front rise. these were surprisingly not granny cut. my biggest beef with short/pants out there is that the waist is either old lady high or just low enough that they hit below le leftover bebe belly. not super attractive. the construction was pretty simple and straightforward. 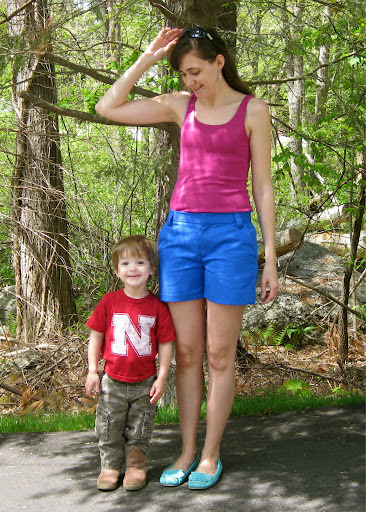 i had made a couple pairs of shorts for my son, so this wasn’t entirely foreign territory for me. the pattern directions have the fly reversed though, which is weird. as in zip with the left hand instead of the right. i don’t know if that is an old fashioned thing, or what. i’m pretty sure most ladies zip their own pants these days. it got a little confusing as i constructed the fly the way every pair of pants or shorts i own is constructed because i had to reverse every instruction—left for right and right for left… eventually i managed to get it all sorted. i also added a fly facing. why this little detail is omitted is beyond me. i don’t get it. us sewists can construct ball gowns but not a fly facing? please. 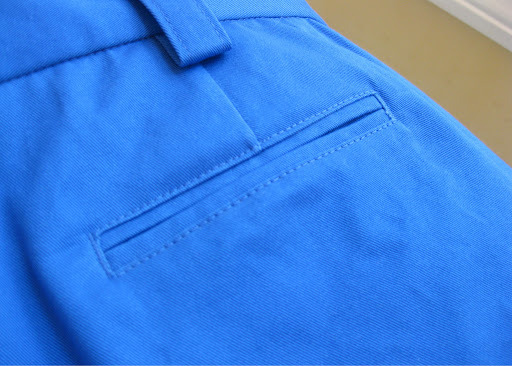 mmm… i heart welt pockets. i did have to sew the waistband with miniscule seam allowances to make up for the extra width, but that’s not a big deal. next time i’ll think to make the waistband longer from the start. i also added back welt pockets. welt pockets can be a little tricky, but i still wish the pieces and placement were included on patterns. i mean, you could always opt to not put them in. right? all in all i am super happy with my shorts and i have worn them a ton! i’m itching to make up another pair with a couple more changes to perfect the fit and add a little more top stitching. by the way, have you noticed the severe laziness in RTW these days? most of the shorts i own don’t even have waistbands! they’re fake! i thought maybe this was just because i buy cheap clothes, but out and about i spied a pair of not so cheaply branded shorts sans waistband! is this lazy or just a “design element”? i really don’t know. my money is on cheap and lazy, but that’s not to say i’ll never copy this move. i do have a weird hate for cutting out waistbands. 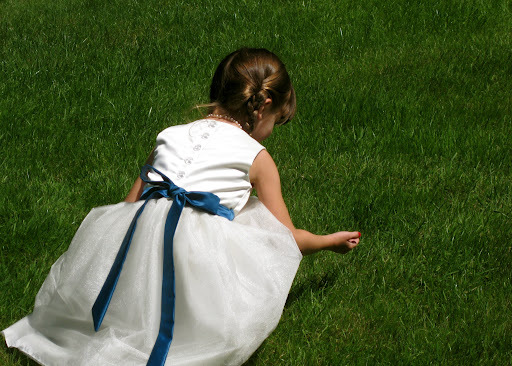 while i was putting the finishing touches on THE WEDDING DRESS i made up my daughter sylvia’s flower girl dress in bits and pieces when i needed a break from all that hand sewing. 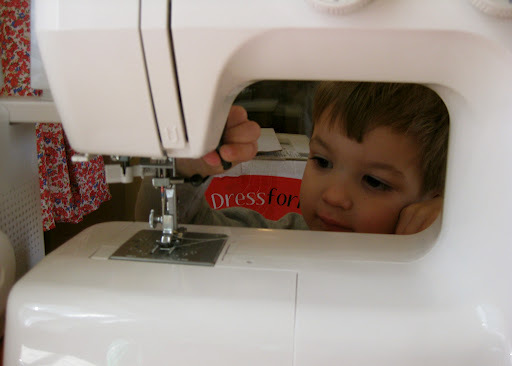 so, yes… i sewed when i needed a break from sewing… totally normal. for the flower girl dress i tossed around a few self-drafted ideas and sketches but nothing really hit me. 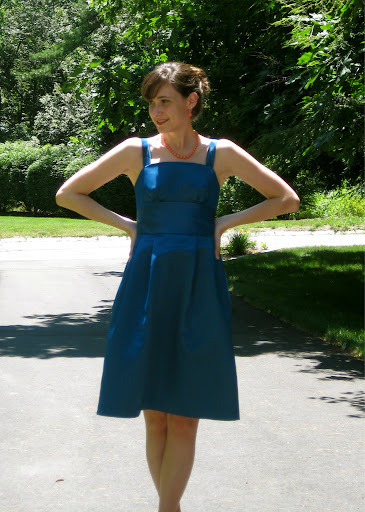 it needed to “go” with the wedding and bridesmaid dresses without matching. it needed to be fancy. it needed to be fun. it needed to be easy. 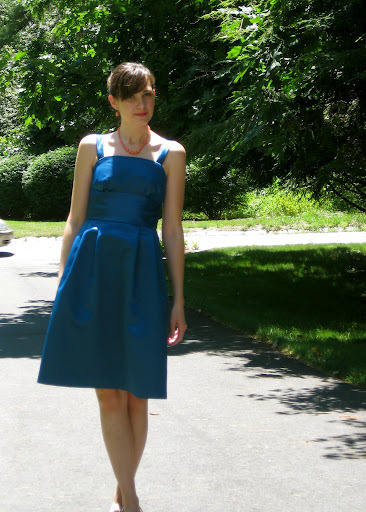 then i remembered the chloe dress by violette field threads which fit the bill perfectly! oh… em… geeee… is this not the cutest thing ever? 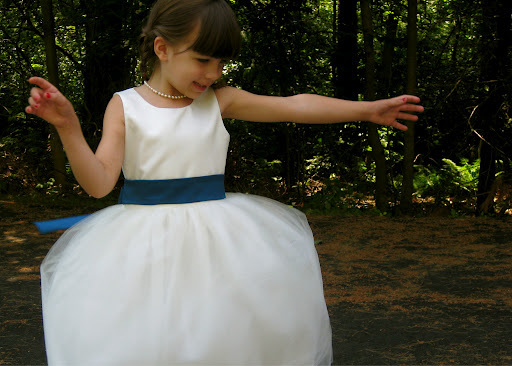 this is such a cute dress, and while i probably could have drafted something similar myself, i’m always curious about construction details (specifically how to do that tulle skirt) and this one promised pages and pages of pictures and instructions (that and i deserved a bit of laziness). fortunately i was not disappointed! 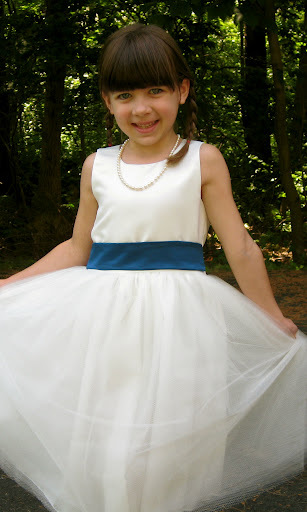 and turns out the methods i’ve used in the past dealing with tulle were pretty much spot on. my daugher, sylvia is an average 6 1/2 year old in size. i wanted a closer fit than the pattern calls for and i wanted the skirt to hit her high-ish on the waist. after careful measurement of the pattern pieces i cut a size 5 and made up the lined bodice in about an hour out of scraps from the wedding dress. it fit perfect, though i needed to slice out a half inch wedge from the back bodice pieces as in a swayback adjustment. it calls for buttons down the back so i found some cheap faceted clear plastic buttons. in a way it mirrors the beading down the zip of the wedding dress, so i went with it. since i left the little opening in the skirt, i just folded it around the back opening of the bodice and stitched it down. now, since this is fluffy tulle it all worked out just fine. any irregularities are more than hidden. for a regular dress, this probably wouldn’t look so hot (since there are multiple layers not sewn together up the back seam). 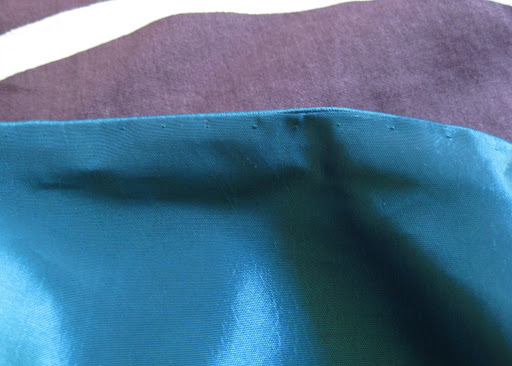 then i added some bias binding to finish the inside of the skirt at the waist to keep it from being too itchy. the sash i made out of the dark teal which will be used for the bridesmaid dresses. 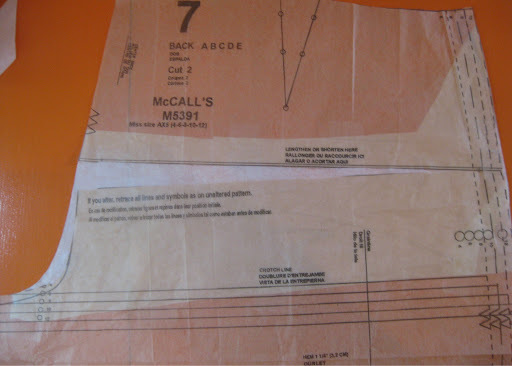 the directions have you sew this directly onto the front of the bodice. i opted to keep it separate, though i may tack it on at the sides for the sake of the wedding so it doesn’t shift around but could still be easily removed later. 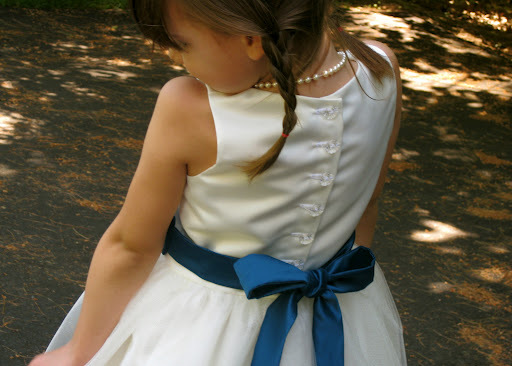 i also lengthened the sash ties and angled the ends for a more dramatic bow. overall, i love this dress pattern! each time sylvia has put it on i’ve had to practically rip it out of her death grip. for her, this is an everyday sort of dress. and my little four year old izzie has already requested her own, naturally. doesn’t every little girl need a ridiculous pouffy dress like this? 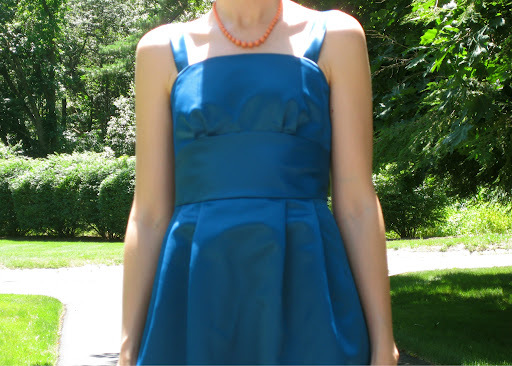 it’s one of those low cost, fast to make, high impact dresses. 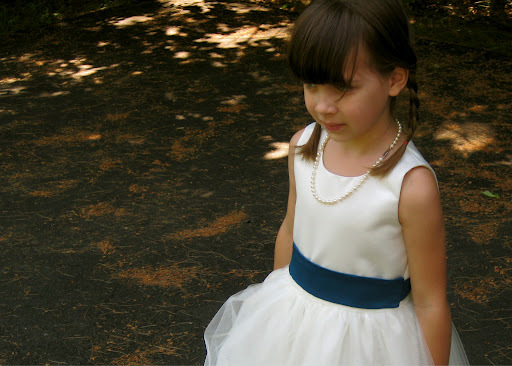 violette field threads has several other super cute kids patterns too (the emmaline dress is to die for…). if you have a little girl in your life you need to check them out! the wedding dress is finished!!! 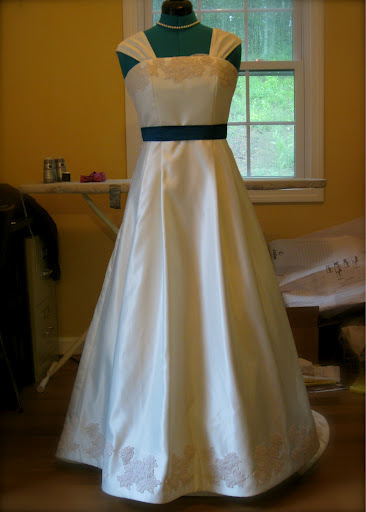 a long time ago i agreed to make a wedding dress for my sister. future me always has lots of time on her hands. thankfully the dress is FINISHED and has been shipped 1600 miles to it’s very eager recipient. i waited on pins and needles (no pun intended…) and with untold anxiety until it got there and ya know, got zipped into. or perhaps we should just get out of my head now and talk about the dress! 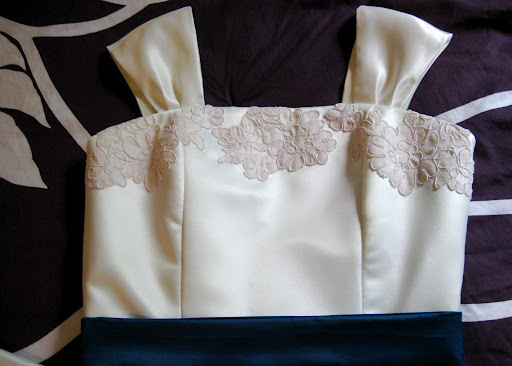 when last i posted i was showing the bodice interior. i finished up the bodice with a hand picked standard centered zipper. i just don’t trust an invisible zipper to handle the number of layers going on in the bodice. i’ve never had one fail me, but this was not something i was about to risk! since i was hand picking i decided to add some small beads with each pick stitch. can’t say i’ve ever seen this done before, but i think it does look pretty and adds a special touch to an otherwise mundane thing. 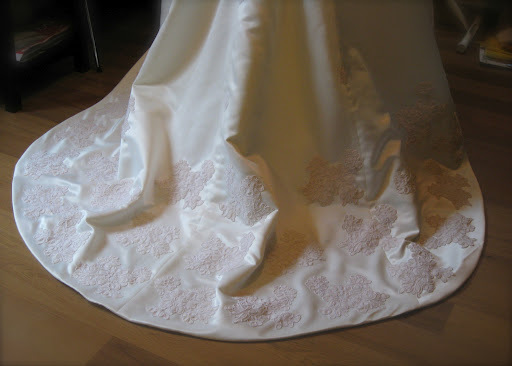 of course, a wedding dress just isn’t a wedding dress until there is some silk involved. 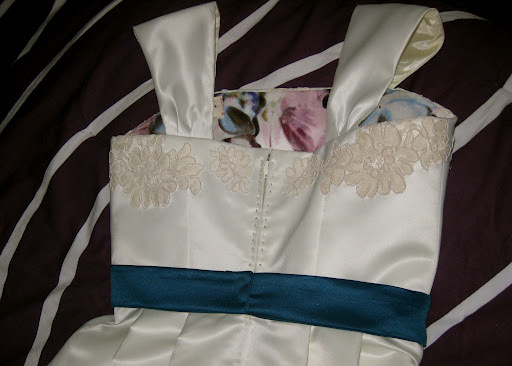 i decided to surprise her by adding a silk lining to the bodice. my hope is that it will be nice and soft to the skin as well as a touch cooling since the rest of the dress is a stiflingly hot polyester. 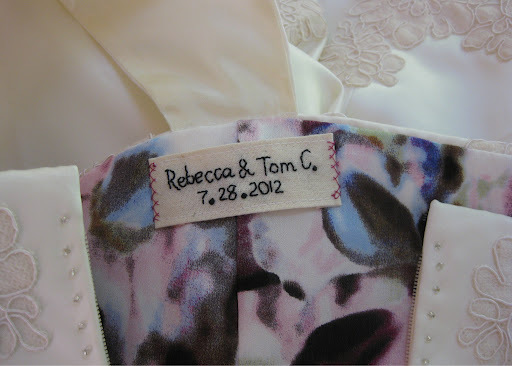 also, i hand stitched a tag with their names and wedding date. as you can tell, i’ve been going for a classic timeless look. but i wasn’t about to leave it without embellishment! and so i began a saga with lace. the lace i used is actually leftover from what was used on my wedding dress, which was made by a family friend, and is ten years old. this lace is rather a collection of floral motifs on netting that has cording to outline the details. so i cut out the individual flower motifs then dyed them from their original bright white to ivory. oh the lace… the lace could practically be a post in and of itself, but i’ll spare you the drama. 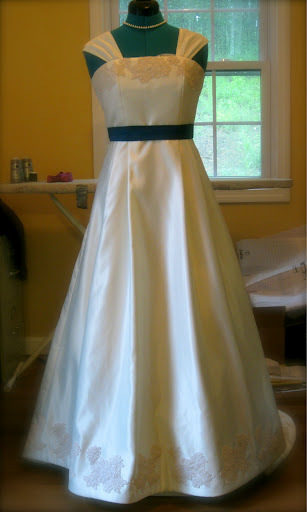 i began with a tea dye and ended up with an ivory color, but next to the dress it just looked brown and dirty. so i washed the lace to remove some of the tea color then used a heavily diluted RIT dye in golden yellow to change the tone to match the fabric closer. after much duress i finally ended up with a color i was happy with. i kept reading about how polyester won’t take dye and this and that… turns out it will, as i highly doubt this lace is cotton or silk. the time comes! i just had to show off my work before that. honestly, i exhausted myself on this dress (and i didn’t even tell you about how i hand stitched the hem… twice) so having a little distance from it (literally!) and knowing that it arrived safely and all of those awful things i imagined happening didn’t… i am immensely proud of my work. it isn’t perfect and i know it’s every flaw (please don’t feel obliged to point out my mistakes), but come on… i made a wedding dress!. and as a bonus i now know that wedding dress making is NOT something i will ever make a living at, and hopefully it will be many years before i am stupid enough to undertake such a project ever again! the end. okay, last easter thing… or maybe we should just call this a spring thing at this point. 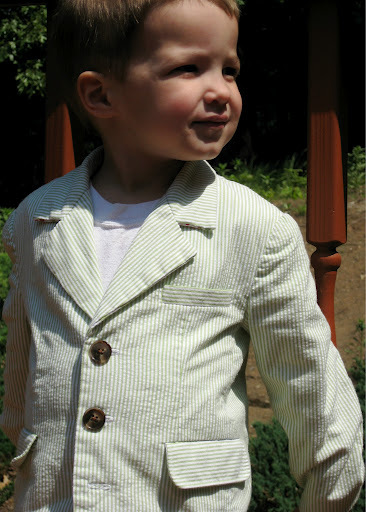 here it is… my baby oliver’s spring seersucker suit. okay, so he’s three and a half and not exactly a baby. being the youngest, i’ll always call him my baby. and what a cutie he is. 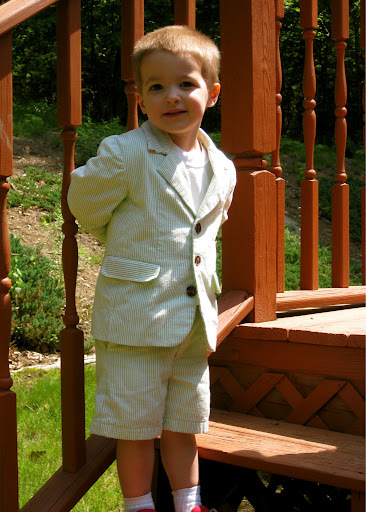 i got the wickedly dumb idea to make him a suit for easter. 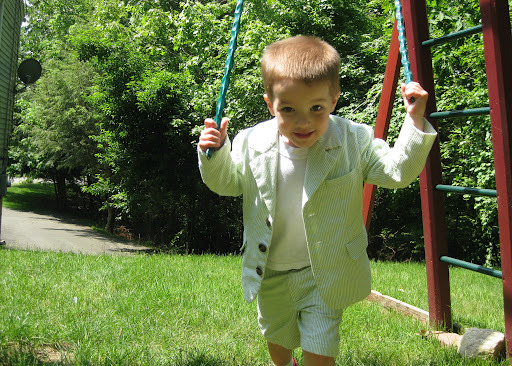 i already had the idea in my head and told him i would make him a suit out of green striped seersucker (green is his favorite color) and he was super excited to get a “work outfit” (because daddy always wears a suit to work). then i noticed the dreadful lack of boy patterns, particularly non elastic waistband or drawstring patterns. thankfully, i found this little number from burda style. yay for them for making an actual fully lined blazer and pants with an actual fly sans elastic waistband pattern! whew! for a while i thought i would have to do some major pattern hackery. remove the presser foot and put it back on for me. while the pattern directions were quite succinct to say the least, all the major construction points were covered. including welted flap pockets on the jacket. 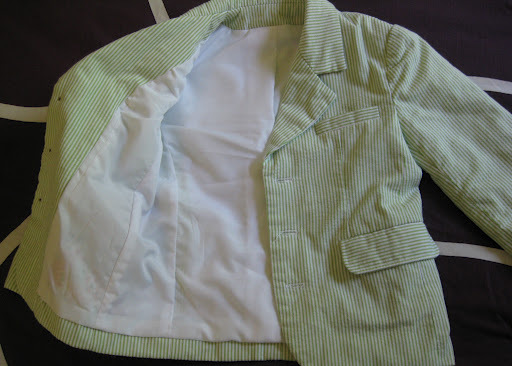 the only additions i made were welt pockets on the back of the pant and an upper chest pocket on the jacket. 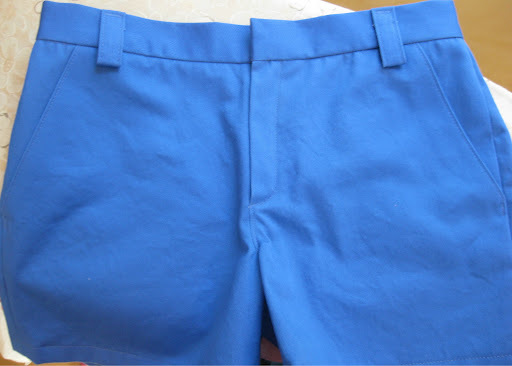 i also added an adjustable elastic to the inside of the waistband, though he barely needed it. he is a little on the small side, but the smallest size on the pattern was just big enough to give him some growing room. when i took the plunge and started cutting the fabric i really didn’t know if it would fit him at all, but thankfully it does with no alterations! the thing you gotta know about a suit pattern is that the jacket has approximately one billion pieces. plus, the seersucker material was fairly thin and needed underlining. 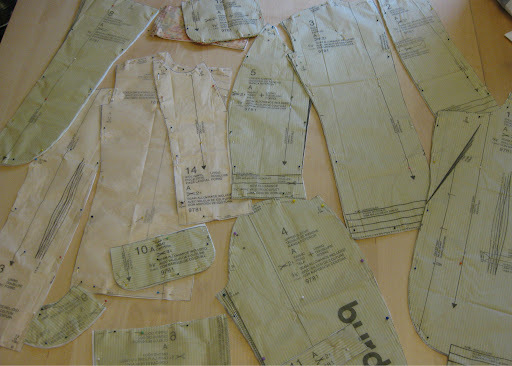 plus interfacing in places… sheesh. 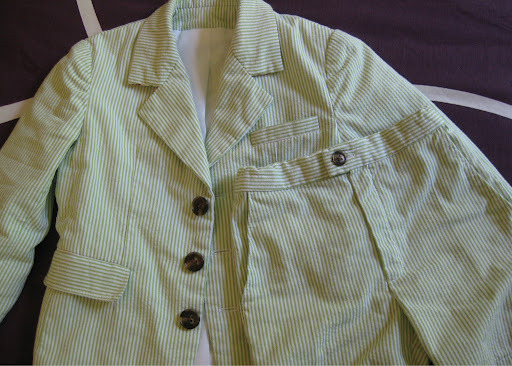 here is the jacket alone! i was a little intimidated, not to mention beat just from cutting all those pieces (some two and three times!). i plowed ahead and made the whole thing without incident! let’s just admire it, shall we? 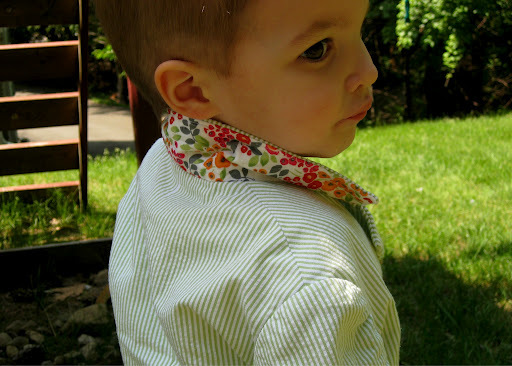 patterned undercollar. because he’s stylish that way. to say i’m proud of how this turned out would be an understatement. common words could not describe my joy at finishing this and loving the result! 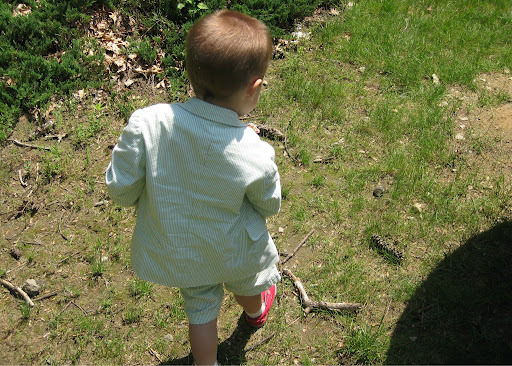 believe you me, he was the best dressed three year old boy in the universe that day.